Brahmanda Guruji Shri Narendra Babu Sharmaji played this song in his Bruhat Brahmanda Programme on occasion of Krishna Janmashtami. I hear this song again and again... I dont know how many times.. Sorry, I dont have the photo of the girl. may i know who composed this song? while listenig this song, i am going into transe of Lord Krishna. where can i download this song. Please go through the post completely. To Download check the 5th line in this post. Thank you.. amazing little girl's voice. do you have any infm about the small little baby?? amazing song....completely sweeps u off the floor into clouds and beautiful sung by the kid. nice song. can anybody give the name of the singer and if any other songs sung by this singer. awe some beautiful voice.any videos or any other songs by this girl.its so wonderful. every one who listen to this song 1st time they forget evthing at that moment except hearing that marvelous voice. lord kirishna may given that voice to her. Does anyone know the kid's name? Litterally fan of this kid. I see my youngest daughter in her... so cute. I dont have children how luck if i am blessed girl child same like her by god bless. I saved this song in my mobile as well ringtone and its going to be in my mobile forever because its my all time favourite song. Its really very beautiful song.i love this song very much. and may god bless that child. it's great and rocking voice. lifts emotions and frees all tensions, god bless the child and one and all who are related to this. this girl should be given bharataratna. hi her name is Gouthami from Dakshin Kannada. The best song ever.. Takes me to a different world altogether.. May God bless dis little girl.. her voice is the cutest on earth.. Jai Shree Krishna!! this is the best song. Its a Awesome song.... Can U plz send we the link to download Mp3 & aslo the video version. Plz mail the link on catchnatwar@gmail.com. first time i heard this from my very very junior niece, i am really felt it is awesome. i still continue to listen this song at regular intervals by opening google. Lord Janardhana bless this gifted child abundantly. Finally i've found this amazing voice singing live. I was searching for this song from a long time, finally i got it here. Thanks a ton. very sweet voice. If any one finds any details of the sweet little girl plzzzzzz..... let me know.Her voice is Krishna's grace. i cant believe a child can have such a amazing voice and clarity of speech........truely divine this child is...she seriously have some spiritual powers in her voice....God bless her.. Wow!! stupendous greeting to the child.....You are really amazing. I LOVE this song..
where can i download this song?? but there will be only a single song which touches you...!!! and mine is "this one"
superb song. . . . . . .
My daughter (10 months old) listen to this song atleast 5 times a day. So sweet voice she has...loved this song :)thank you for putting this song..
HI can anybody tell me who is the author of this beautiful song? Great Song...No words..i love the voice very much.i listen it every day...........GOd bless the little singer..LIve long with sweet voice at the holy feet of KRISHNA. touching our heart and soul. Hi All, i am having a 6 month old little angel and whenever i put on this song she use to stop all her nuisance and starts enjoying this song.All these days i was very eager to know about this little singer, luckily today I got a chance to watch a live interview of this little singer in kannada channel ( Suvarna 24x7 new channel). Recently one of the channel telecated this song and claimed that this is tribute to the little singer who was no more.But in reality the little singer is alive!!! The little singer is badly hurted due to this nuisance telecast and Suvarna channel tried to give strength to the singer by arranging a live interview. The little singer name is Gouthami and she is from Karnataka. Right now she is balancing her singing career with her study. Let god give her more strength and courage to overcome from this incident and let Gouthami give us more & more heart touching songs in future. Truly remarkable voice with such clarity. Saw the interview on TV; that the girl lost her father at a young age and was brought up by her mother with a lot of struggle and the fact that she is concentrating on her studies as top priority is very touching. May god give her more opportunities..would certainly like to hear more devotional songs and bhajans from this lovely voice. 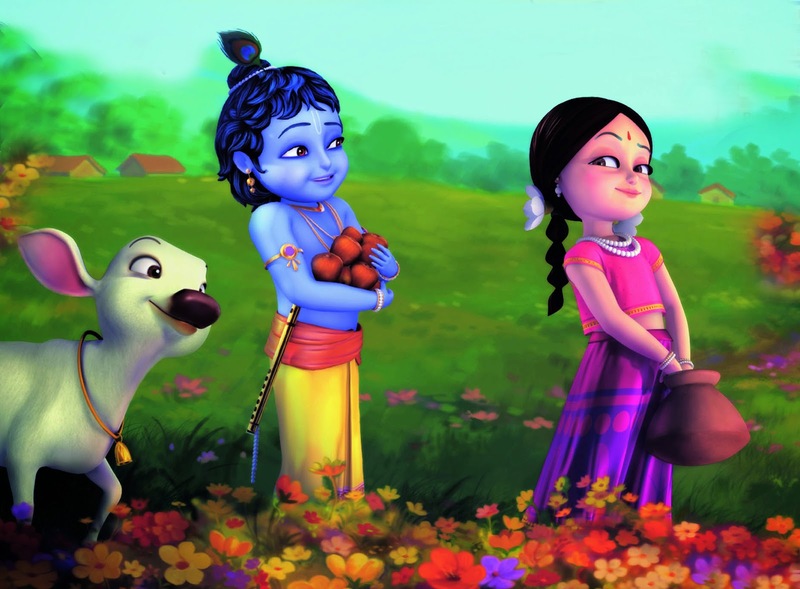 Very beautiful song...with beautiful lyrics...and sung in a beautiful way...Thanks to you and the little girl... Hare Rama Hare Rama, Rama Rama Hare Hare, Hare Krishna Hare Krishna, Krishna Krishna Hare Hare ! Sarve Jana Sukhino Bhavanthu !! soo beautiful song sung by Gautami. God bless you. I want to here more and more songs from your voice. No words so express the feelings..
anu body know who wrote this song ??? This divine song by this divine voice is mesmerizing all thoughts and brings in front the lotus feet of Lord Narayana. can someone give the mp3 link of this song? Please read the complete post, the link is already given. Nice song sung by the little cute girl, hats off to her. My daughter who is 6 years old, is keep on listening to this song available on my mobile phone. Whose is this little girl??? Awesome, I can't resist hearing this daily. God bless the little girl. gayatri: awesome song.. very peaceful. Thanks for the lyrics, my son loves this song. Another song is sung by this girl Gouthami. no words to say.. we cant get a relaxation than this if we pay any invaluable things... its really amazing and very impressive... blessed with a magical voices which has to be continued in her life..
Beautiful song. mesmerizing. Words cannot describe how happy I feel listening to this song. God bless the little singer with long and prosperous life.